Existing home sales, as reported by the National Association of Realtors, decreased 3.4% in October, and the annual share of first-time buyers in 2015 fell to its second-lowest level since the survey was launched in 1981. Total existing home sales in October decreased to a seasonally adjusted rate of 5.36 million units combined for single-family homes, townhomes, condominiums and co-ops, down from 5.55 million units in September. October existing sales were up 3.9% from the same period a year ago. 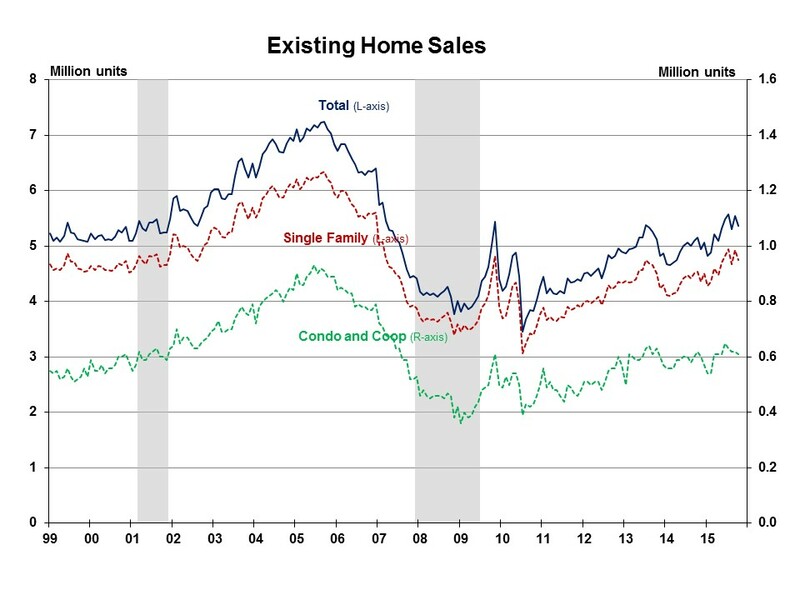 Existing sales were flat in the Northeast and fell 0.8% in the Midwest, 3.2% in the South 8.7% in the West. Year-over-year, all four regions increased, ranging from 8.6% in the Northeast and 8.3% in the Midwest to 2.7% in the West and 0.5% in the South. Total housing inventory decreased by 2.3% in October, and is 4.5% below its level a year ago. At the current sales rate, the October unsold inventory represents 4.8-month supply, compared to a 4.7-month supply in September. One-third of homes sold in October were on the market for less than a month. The distressed sales share fell to 6% in October, the lowest since the series began in October 2008. Distressed sales are defined as foreclosures and short sales sold at deep discounts. The October all-cash sales share remained unchanged at 24% in October, compared to 27% a year ago. Individual investors purchased a 13% share in October, unchanged from September but down from 15% during the same month a year ago. The October median sales price of $219,600 declined to the lowest level since April, but was 5.8% above the same month a year ago, and represented the 44th consecutive month of year-over-year price increases. The median condominium/co-op price of $207,100 in October was up 1.6% from the same month a year ago. The Pending Home Sales Index decreased for the second consecutive month in September to its second lowest reading in 2015, so a deceleration in existing sales was not unexpected. Although the share of first-time buyers increased to 31% in October from 29% in September, the long-term weakness in that market continues to create headwinds for prospective trade up buyers and retirees who need to sell their existing homes.